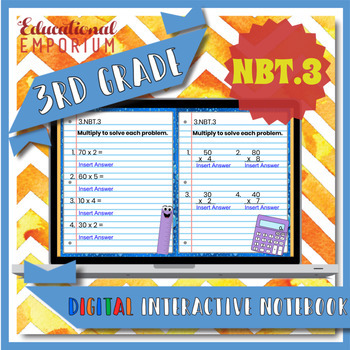 This 3rd grade Google Classroom interactive notebook provides guided instruction, example problems, and quick references aligned with common core standard 3.NBT.3: Multiply by Multiples of 10. Now you can get all the interaction and engagement of interactive notebooks without all the mess of cutting and pasting and the hassle of lost papers. 3.NBT.3. Multiply one-digit whole numbers by multiples of 10 in the range 10-90 (e.g., 9 × 80, 5 × 60) using strategies based on place value and properties of operations. 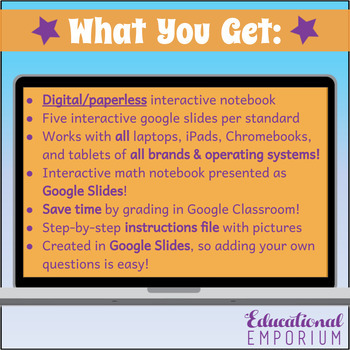 Designed to make the classroom efficient and interactive, these resources are presented as Google Slides, eliminating paper and planning. These digital notebooks are perfect for laptops, iPads, Chromebooks, and tablets of all brands and operating systems! The product file is a simple PDF with a link to my Google Drive folder where you can copy the resources for your own use. 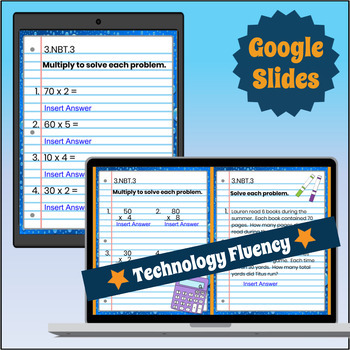 Looking for more 3rd Grade Numbers & Operations in Base Ten Interactive Math Notebooks in paperless, Google Classroom format? 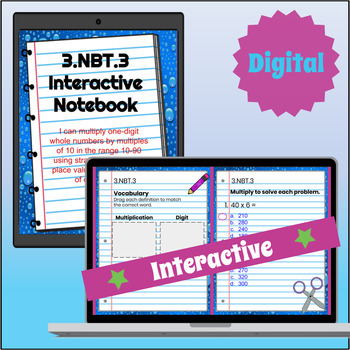 Get the bundle of all 3rd Grade Interactive Notebooks in both Digital and PDF formats for maximum savings!